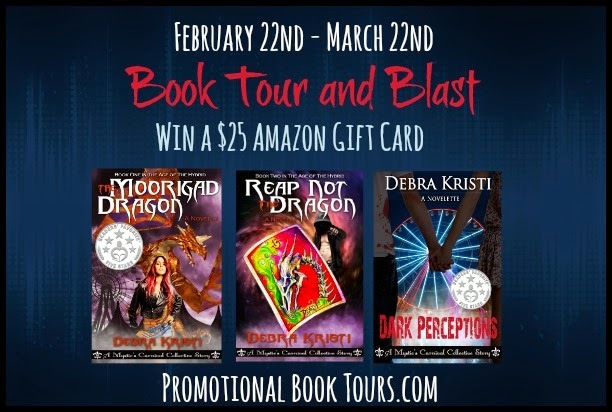 The Moorigad Dragon and Reap Not the Dragon Book Blast: Read an Excerpt and Enter to Win a $25 Amazon Gift Card! 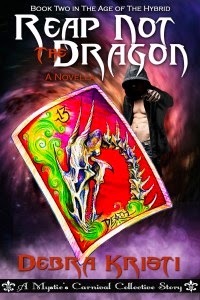 Kyra thinks saving Marcus’s life is easy -- slick as dragon snot -- and a one-time deal. The resulting bond tying her to him and enslaving her as protector is unexpected. 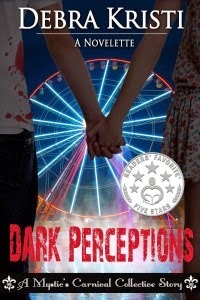 Love is stronger than fear … or is it? Perceptions can be excruciatingly misleading … and some monsters have hidden claws. Sebastian is finished following commands. Higher powers be damned. He has his own agenda -- find Kyra and help restore her memory. A detour -- unexpected and unwelcome -- delivers Sebastian into the depths of an grave situation. Misfortune and misunderstanding are the cards dealt to him. And events fail to flip in his favor. 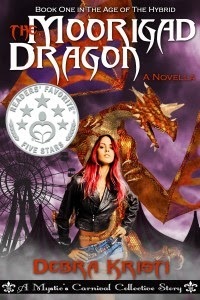 Sebastian must find a missing dragon and the key to Kyra’s memory without being devoured by sinister beasts or -- even worse -- consumed by his own inner demons. Tension tightened Sebastian’s back and shoulders. It wasn’t the request that got to him. It was the sound of her voice, the anxious need. “Better yet, why don’t you ditch work? Come with me now. I can take you somewhere that might just be exactly what you need—” Without warning, Sebastian’s jaw locked up, his every muscle froze, and he couldn’t move. What the f---in’ hell is going on? his inner voice yelled, and his eyes darted left and right. He couldn’t respond. Couldn’t will his mouth to work or voice to answer. But his gaze narrowed in on the culprit, standing not-so-inconspicuously by the creamer station. Tall, gray suit with hat pulled down to shield his facial features, and a cheesy name tag tacked to his chest, probably his father’s lame idea. All part of the everyone-get-to-know-Sebastian movement. Except, all the names were fake. So what was the point? The Reaper across the room was no more named Mr. Johnson than his father was Mr. Smith. Damn Reapers. Now Sebastian had a tail because his father didn’t trust him on his own. His gaze shifted to Kyra. “Sebastian?” Kyra’s eyes bored into him, large and wide. Debra Kristi found it rather dull always staying tethered to reality. She decided to let whimsy get the best of her, and with the help of her muse she began bringing magical stories to life in 2010. It’s been nothing but write, write, write and type, type, type ever since. Born and raised a Southern California girl, she still resides in the sunny state with her husband, two kids, and three schizophrenic cats. A lover of fanciful stories at a young age, she hadn’t realized the writer bug infected her until much later in life. As a result, her stories pull from a rich history of experiences. Enter to win a $25 Amazon gift card through the Rafflecopter form below! Time Winders Book Blast: Giveaway for a $25 Amazon Gift Card! Synopsis: Tanya is a beautiful young Time Cop chasing criminals through Time. James is an 82-year-old widower. How did these two get stuck together, tracking down a rogue agent? Is someone manipulating the outcome from the future? And what’s with the tea? James sort of got it. He knew the Earth was roughly 24,000 miles around, so with 24 hours in a day you’re moving about 1,000 miles an hour. If you could theoretically float above the surface (without being flung at 1,000 miles an hour when you left), the planet would rotate beneath you. It would be like traveling at 1,000 miles an hour. There is a tour-wide giveaway. 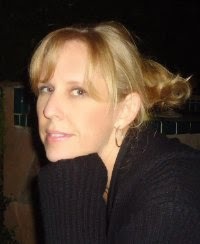 Jennifer Novotney was born in Burbank, California, and lived in Los Angeles for most of her life until settling in Northeastern Pennsylvania with her husband and daughter. She attended California State University, earning a bachelor's degree in journalism, and Northern Arizona University, earning a master's degree in English. After college, she spent several years writing and teaching, including at Pennsylvania State University. In 1959, a heavily pregnant Kit Haugen seeks refuge in a bedroom at her grandmother’s old hotel, The Sand Drifts Inn. There she finds a battered, old diary containing a story long forgotten. It is the tale of her grandfather, Reggie Arkwright, a psychic soldier whose talents were put to use in the First World War. Though Kit has always thought of her grandfather as a hero, she is about to discover the horrifying truth of life and war in 1915. So this was a trench. It was a deep furrow in the earth that was wet from an unseasonably damp autumn, and I was thankful that I couldn’t smell whatever it was that was making my soldier’s nose twitch violently every now and then. Another hideous bang went off overhead, its echo rolling like thunder, and my man dropped to the floor, covering his head with his thickset arms. Mud and debris flew everywhere, slapping him hard on the back with a heavy, wet slop. His gaze travelled down the length of the ditch in the ground, where I could make out six other figures huddled down in similar states of shock. Something small and bright suddenly flew past Abdul’s vision. Before he could even glance at it, there was a terrible bang -- a louder sound than I had ever heard in my life. In a matter of seconds, a huge flash of white light filled the trench, leaving me blind to whatever had caused the explosion. I winced at the sudden burst of intense pain in Abdul’s chest, a searing, white heat passing over every part of his skin, burning into his body with wild abandon. Born in South Wales to Raymond and Jennifer Finn, Kimberley Charlotte Elisabeth Finn (known to readers as K.C., otherwise it’d be too much of a mouthful) was one of those corny little kids who always wanted to be a writer. She was also incredibly stubborn, and so has finally achieved that dream in 2013 with the release of her first three novellas in the four-part Caecilius Rex saga, the time-travel adventure The Secret Star and her new urban fantasy epic The Book of Shade. As a sufferer with the medical condition M.E./C.F.S., Kim works part-time as a private tutor and a teacher of creative writing, devoting the remainder of her time to writing novels and studying for an MA in Education and Linguistics. For a daughter, at age 61, being called “mommy” by her own mother was a heart-wrenching experience. This happened to Dody during the course of a three-year adventure as the full-time caregiver to her mother, much loved yet caught up in a downward spiral of physical, mental, and developmentally regressed disabilities. Each day was an adventure, because when dementia is present, the typical actions involved with her mother’s daily care habits became unpredictable. The experience is also termed an adventure because of the surprising twists and turns of emotion that arose in Dody, compelling her to recognize and face deep-seated fears and unwanted emotional reactions when her performance was not in accord with the spiritual vision that she had of herself. Moments of comic relief saved Dody from the depths of despair during pill-taking and messy hygienic episodes, and during her mother’s nighttime delusions. The mantra that kept her going was an echo of her mother’s life-long response to any calamitous event: you can do what you have to do. ADVENTURES IN MOTHER-SITTING is not just a chronicle about the dementia-induced antics of an independent, spirited mother as she approaches the time of her death. The book is also about Dody’s journey through a rollercoaster passage of grief that gets intermixed with surprisingly sweet instances of joyful connections with her childlike mother, but also with her innermost self. Throughout the book, Dody portrays the ways in which the physical and mental needs of her mother and her own emotional, spiritual needs lovingly served each other and how dementia served them both. The memoir depicts the role changes that occur in the relationship between Dody and her beloved mother, but more so, it portrays the more compassionate relationship that she gains with herself as she learns to walk more honestly and gently with her fears, worries, and shortcomings. As had become her usual habit, Mother fell asleep shortly after her dinner, around 7:30 p.m. After cleaning up the kitchen, I watched some TV then started working on a jigsaw puzzle in order to stay awake until midnight. If Mother didn’t wake up before midnight, there was a good chance that she would sleep until morning. By 10:30 p.m., however, I couldn’t keep my eyes open so gave up the puzzle and crawled into bed. About to drift off, I groaned when I heard noises coming from her room, sounds that portended the smooth flow was about to change. It was a few minutes before 11:00 p.m. when I heard Mother babbling loudly in conversation with what I assumed to be was her cast of invisible nightly visitors. I stayed in bed at first, annoyed that her medications were not doing their job in managing the delusions. She wasn’t jangling the bedrails for all she was worth, so I did not feel an urgency to get to her room. However, when the word “catheter” zoomed into my foggy brain, I jumped out of bed and hustled down the hall, slowing as I got to her door. Mother was touching the bedrails a little when I peeked into her room, but she did not need me at all. She was having a pretend conversation with the three stuffed animals that shared her bed. Mother was trying to place the little bunny-eared duck onto the bedrail after having successfully propped her larger otter and tiger onto the rail. Now with a brain set at toddler age, Mother was talking and playing with her stuffed animal friends. In the midst of my recent musings about why humans hang onto life when any quality left in living seems almost nonexistent, an unexpected answer had come my way. My annoyance disappeared immediately and was replaced with a feeling I had never felt so strongly before: fierce belly-warming surges of love and protectiveness. This must be what mothers feel when they watch their toddlers at play, I thought while gazing with moist eyes at Mother. If I had stepped into her room at this moment, I am sure that she would have given me one of her toothless grins and tried to say, “Look, Mommy!” But I didn’t step into the room. I’m sure my heart would have burst if I had heard those words. Love and tenderness had enveloped me so completely—it was hard to contain this unexpected sense of motherhood. I stood and watched until she had drifted off to sleep then went in, picked the duck off the floor, and tucked Mother in once more. After getting back into my own bed, I lay awake for a while and thought about toddler-age children. Most are unable yet to totally understand the onslaught of images, words, objects, and noises that come and go at them throughout their day. Make believe conversations and playacting with small dolls, stuffed animals, and toys engages them completely; to them, their play is real. So, too, was having make-believe conversations with stuffed animals and imagined people so real to Mother. During delusions, her hand gestures became flamboyant, her face animated, and even her sentences were understandable instead of garbled. This particular incident made me consider a poignant question even more seriously: is it possible that, on some level, dementia can be viewed as a blessing for those who have it and are at the end of their life? For people with dementia, make believe seems to be as much a part of end-of-life experience as it was when they began life as a child. A wave of melancholy hit me strongly then as sadness over the loss of Mother’s adult personality and her motherly presence in my life moved through me. After this wave passed, a feeling of gratefulness lightened my grief. Mother was having her own experience of delightful fun, so real to her. The dementia that had caused her brain to regress back to the age of a toddler served a greater purpose than I had ever imagined. It was me that had to adjust and discern the benefit to her. The pictures I took of Mother lying in bed surrounded by her animal friends are priceless to me. She loved each one and handled them differently. She was constantly putting on and taking off beaded bracelets from around the neck of her bunny-eared duck. Toward the end of her life, a bunny rabbit propped up Mother’s head when it weakened and began to droop. After her death, each of us took one of her animal friends into our homes. They are our reminders that Mother did experience her own brand of end-of-life joy. Born with a sense of wanderlust, Doreen (Dody) Cox had a somewhat convoluted career path, working in various business-related and mental-health occupations. When dementia began to debilitate her mother, Dody resigned from her job as group counselor at an alternative school in order to take on an unforeseen endeavor: become her mother’s care bear. It was after her mother’s death that Dody’s path took another unexpected turn. She chose to honor her mother’s long-held wish: for her to write a book. ADVENTURES IN MOTHER-SITTING is Dody’s first publication, a memoir that emerged from the pages of her journal. Writing was a steadying outlet throughout the three years that dementia took her and her mother on an unpredictably tumultuous, yet heartwarming adventure. Currently, Dody lives in her native Florida and works part-time, teaching a GED class comprised of multicultural adults in one of her favorite places: a library. She continues to write and has recently published A SACRED JOURNEY, a fictional short story with themes relating to nature, spirituality, hope, and dignity in death. All her life, she thought she was alone as a mind reader -- a freak. Stephanie currently has three projects planned for 2015. Her upcoming release is well underway and is slated for a March 2015 publication date. Stephanie, of course, loves to read and write. She also enjoys living on the beach on Florida's Treasure Coast. Most of all, she and her husband are in love with their baby girl. One lucky winner will receive a $25 Amazon gift card! Enter through the Rafflecopter form below. This giveaway is international. The Resistance Book Tour: Giveaway for a $15 Amazon Gift Card, Clean Teen Publishing eBook and Bookmark Swag Pack! The morning air is crisp and cool, the grass springy and damp beneath my feet. Droplets of water are refreshing against my bare calves as I run. My high ponytail swishes side to side, tickling the back of my neck. My chest rises and falls as I concentrate on breathing, filling my lungs with the cleansing autumn morning air. Dog lopes along beside me at a steady trot, his paws padding softly on the ground. I have spent every morning of the last six weeks running from one end of Resistance Headquarters to the other. It spans exactly four miles. I appreciate watching the changing of the seasons each day, even if it is just a computer program. It’s nice to feel—in some ways—like we are still part of the world. When I’m on my morning run, just Dog and me, I can pretend that nothing has changed. I can almost imagine my Atlanta neighborhood with a park very similar to the one I’m running in, ringed in pine trees. I can imagine the crunching of dry pine needles beneath my feet, and smell their fragrance in my nostrils. There is no Resistance, no Restoration, and no evil president. The M.P.s have no cause to suspect a young girl out on a run with a dog, and they don’t spare her a second glance. Actually, even in reality, there is no Gage because he’s gone. He’s gone because I cast the deciding vote. Make no mistake—I’d do it again in a heartbeat. Reality is crueler than my fantasy. In reality, the Restoration is very much alive and in counterpoint, so is the Resistance. The M.P.s will never see me as just a girl. They fear me, what I am, and what I have the potential to become. In reality, Dax is here daily, a continuous reminder of my flaws and inability to love anyone completely, the way they deserve. In the real world, Olivia and Jenica are shells of their former selves. The former has sunk into herself and retreated from the world; the other lashes out at it with all the venom and malice she possesses. No matter how much I want to try to imagine an alternate reality where things happened differently, I am always snatched back to the present. No matter how fast or hard I run, I cannot outrun Gage. His absence is more tortuous than his presence, when I’d thought it would be the other way around. I thought that by sending him away, I would finally be able to put my turbulent feelings behind me. Foolishly, I assumed that without having to look into those gorgeous blue eyes of his, I would no longer be a slave to my emotions when it comes to him. By cutting him out of my life, I could stop feeling so damned much. I liked it better when I was numb, when nothing fazed me because I’d built my walls and fortified myself against it all. But then Dax kissed me and told me he loved me, and Gage made me feel like a normal person again. Together, they made me forget. But I don’t intend to forget again. I want to remember the pain that caused me to go numb, why I avoid these kinds of complications, and why I’m better off alone. At least, in my love life… I will always remember. Where the rest of her village celebrates this mystery that binds men and women together, seventeen-year-old Noll is just done with it. She’s lost all her childhood friends as they’ve paired off, but the worst blow was when her closest companion, Jurij, finds his goddess in Noll’s own sister. Desperate to find a way to break this ancient spell, Noll instead discovers why no man has ever loved her: she is in fact the goddess of the mysterious lord of the village, a Byronic man who refuses to let Noll have her right as a woman to spurn him and who has the power to fight the curse. Thus begins a dangerous game between the two: the choice of woman versus the magic of man. And the stakes are no less than freedom and happiness, life and death -- and neither Noll nor the veiled man is willing to lose.